Bangai-O Spirits is the last game by Treasure in their DS era. 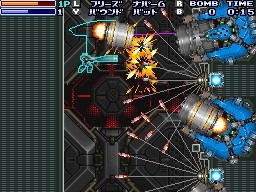 It is also the second game in the Bangai-O series, preceded by Bangai-O on the N64/Dreamcast and succeeded by Bangai-O: Missile Fury for Xbox Live Arcade. Treasure is a company known for games that contain an unparalleled sense of energy and the original Bangai-O was no exception, marrying great level design with a focus on speed and progression through the levels not unlike Treasure's previous games such as Gunstar Heroes and Alien Soldier. But how does Bangai-O Spirits fair compared to Treasure's other games? Treasure games aren't exactly known for having great stories (although they usually have rather memorable characters, especially in their earlier works). Treasure seemed to realise this, confining the story of the entire game in the seventeen tutorial levels, which once completed allows access to almost two-hundred levels to play with. The jist of the story is that two young pilots are taught how to pilot the mecha by its creator. The dialogue is humorous (especially the fourth wall breaks such as one person asking how long it will take to beat the game so he can trade it in) and it serves to keep the player interested in the tutorial so they can go forward into the game. The gameplay follows the structure of the original game. You control a mecha called the Bangai-O. 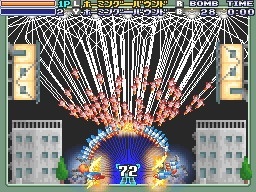 The goal of each stage is to destroy the targets which can range from buildings, bullet-deflecting cores, or other enemies. The main difference from the original game is the assortment of weapons. Each weapon has a unique feature. 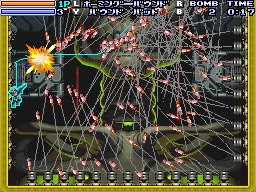 As you might expect the homing missiles home in while the bounce shots can bounce of walls but there are other weapons such as break that pierce through the enemy bullets to gain the upper hand in stand-offs against larger enemies. The other weapons are the shield which leaves you impervious to any attacks from that side but the most 'treasure-like' weapon is the bat which allows you to reflect projectiles, which strikes me (no pun intended) as a callback to the throw mechanic in Gunstar Heroes. 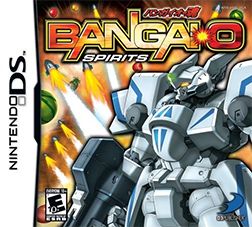 Anyone who's played Ikaruga or Radiant Silvergun (arguably some of Treasure's better games) will know that these games are less like traditional shooting games and more like puzzle games, and Bangai-O is Treasure applying this concept to one of their more regular series. Each stage can be treated as a puzzle with goals, like destroying all the enemies (think the last stage of Gunstar Heroes), navigating a maze to the end of the stage, or traversing a field of enemies before an explosion goes off, killing you instantly. Treasure's use of the mechanics of their past games is what really makes the game shine. It aggregates everything that makes the company's games so enjoyable and gives these components at least one stage to shine. If you don't like how Treasure creates their stages then you are allowed to create your own with the stage editor. The touch screen makes the process intuitive and it gives a game that already has a large amount of content even more room to expand (like with Super Meat Boy). Treasure created a quirky system to transfer save data through sound bytes. When the stage is created a unique tune is made for that stage. By putting the sound output to the DS's microphone you can up/download data from/to the DS to give/receive new stages. Bangai-O Spirits is a game that only Treasure could make. It has the charm of their earlier titles with the refined gameplay of the later titles on the only platform that would make the game work (the other two games had this in mind but I think the DS version does this best.) It was a fitting end to the DS where companies started to realise the potential in the device with titles like this game and The World Ends With You, showing what the DS could really do and it gives the 3DS a bright future if developers continue this trend. I love the Bangai O series, it is fun to destroy the targets and use the different weapons.